Simple to make, incredibly delicious and proven effective, this elderberry elixir has become a natural home remedy staple in our house! My auntie turned me on to elderberries a couple months ago. One bright December afternoon we sat around her kitchen table excitedly sharing our latest DIY projects and recipes. Suddenly she went quiet, her eyes widening to the other side of the room. She giddily reached for an unmarked wine bottle. At first I couldn't believe she was pedaling booze this early in the day, but then thought, This is Auntie we're talking about- it's got to be some kind of homemade potion. And sure enough it was. She asked if I had ever tasted her elderberry syrup as she poured out a couple ounces of the dark, viscous liquid, no doubt a generous portion for something so rich. Familiar with her alchemical genius (she's not only a licensed aromatherapist, but an incredible southern cook) I trusted it would be delicious. I sipped it like an aperitif, a slight touch of brandy lending it the depth and complexity of one. It was bright and jammy with just the right amount of sweetness to balance that elderberry tang. As I savored my last sip, she called it "a flu shot in a bottle." Could something this delicious really be that good for you? Turns out the answer is an emphatic YES, absolutely! Black elderberry (sambucus nigra) has long been used for its healing properties; in the 5th century BC Hippocrates referred to the elderberry bush as his “medicine chest” for its various curative uses. Elderberries have been used for thousands of years to treat digestion, skin ailments, asthma, diabetes, infections, blood pressure, weight loss, joint pain and allergies. Elderberries contain minerals like iron, potassium, phosphorous, and copper, as well as vitamins A, B and C, and loads of immune-boosting compounds specifically shown to defend against the cold and flu. Its anti-inflammatory, antioxidant and antiviral properties have proven effective against various strains of the influenza virus by increasing cytokine production. Another study was conducted in Norway in 1995 where Sambucol was shown to significantly reduce the duration of the flu by approximately four days. The best part is that there are absolutely no side effects- adults and children alike can safely enjoy elderberry syrup at the slightest inkling of illness. Of course you can purchase elderberry supplements online or at a health food store, but you will save significantly by making it yourself. My local food coop sells an 8 oz bottle for $14.85 plus tax. This recipe yields about twice that amount for less than $10. A few words of caution: Only black elderberries (sambucus nigra) are edible. The leaves, stems and other parts of the plant as well as other species of elderberry may contain dangerous traces of cyanide, so always buy your elderberries from a licensed and reputable source. If you harvest your own, consult an herbalist and cook the berries before consuming. 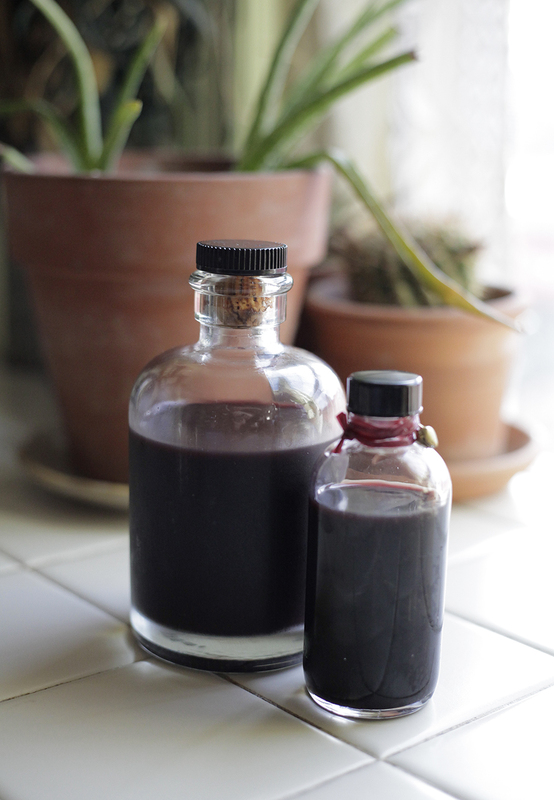 This recipe yields about 16 ounces of elderberry syrup. 1. Bring water, elderberries, cinnamon, cloves and ginger to a boil, then cover (allowing for a bit of ventilation) and reduce to a simmer for 45 minutes. The liquid should reduce by about half its original volume in this time. 2. Remove from heat and gently mash the berries with a slatted spoon. Allow to cool until manageable. Pour contents through a cheesecloth into a glass jar or bowl, squeezing out as much liquid as possible. You can now compost what remains in the cheesecloth. 3. Once the strained liquid is lukewarm (not at all hot!) stir in honey until dissolved, then brandy and store in the refrigerator. Brandy extends the shelf like up to a year in the refrigerator, but you can certainly omit it. Without the brandy, the elderberry syrup will last for up to 2 weeks in the fridge. Alternatively the elixir can be canned. Shake well before each use. Can be taken daily as an immune booster, but for best results, skip a few days a week so that your body does not become reliant upon it. The standard dose for children is ½ - 1 teaspoon, and ½ - 1 tablespoon for adults. If taking to treat the flu, consume the normal dose every 3-4 hours instead of once a day until symptoms disappear. Sometimes I like to savor an ounce (about 2 tablespoons) at a time, twice a day when feeling ill. Believe me, it's delicious enough to sip! DISCLAIMER: The information on this site is provided for educational and entertainment purposes only. It is not intended as a substitute for professional advice of any kind. Bea Rue assumes no responsibility for the use or misuse of this material. Your use of this website indicates your agreement to these terms. Links to external sites are included as pointers to further resources - I do not endorse them or are in any way responsible for their content, nor do I verify that their content is accurate.